Now imagine looking through the side of your head at a cross-section of your brain. You would see the downstairs part of your brain, the limbic brain. The limbic brain is located below the the cortex (upstairs), in front of the cerebellum and above the brain stem. The limbic brain evolved between 200 and 300 million years ago and is the seat of your emotions. It also maintains your blood pressure, heart rate, body temperature and blood sugar levels. The limbic brain is critical to learning and for short-term and long-term memory. It stores memories of your life experiences. The scientist Robert Ornstein says that the easiest way to remember the functions of the limbic brain is the four ‘F’s’ of survival : feeding, fighting, fleeing and sexual reproduction!! The surface of the brain is called the CORTEX. Cortex comes from the Latin word because of the brains convoluted appearance. It is about 80% of the brain. The thalamus makes preliminary classifications of external information coming in the brain. It relays information to the cortex via the hypothalamus. The amygdala is an almond shaped set of brain cells located deep within the temporal lobe of the brain. It is part of the limbic system and is involved in many of our emotions, especially those responsible for our survival instincts and other major emotions like fear, anger and pleasure. It is also responsible for deciding what memories are stored and where they are stored in the brain. The basal ganglia are responsible for movement control especially initiating movement. 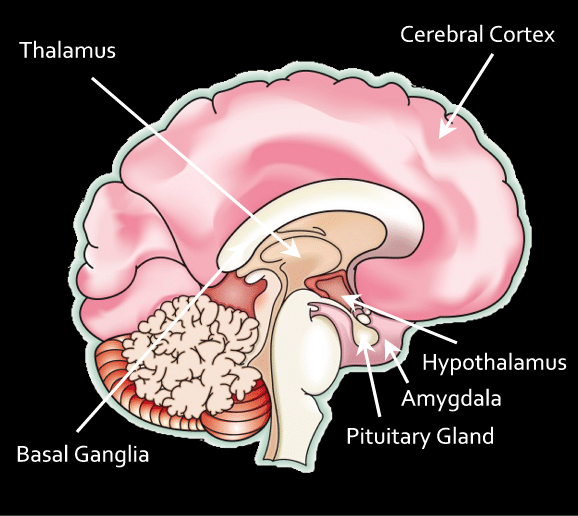 Together with the hypothalamus, the pituitary gland constantly adjusts the body to keep it optimally adapted to the environment. The hypothalamus is thought to be the most important part of the limbic brain. It is tiny, the size of half a sugar lump, and weighs only 4 grams. It regulates hormones, sexual desire, emotions, eating, drinking, body temperature, chemical balances, sleeping and waking. It also controls the pituitary gland. The hypothalamus also decides which information coming into the brain gets your attention e.g., it tells you when you are hungry or too hot.